A modest investment in cleaning produces substantial return With a Clean Facility! Cleaning is an investment in human health, the environment, and an improved bottom line. Discover more about the Value of Clean® with ISSA, the worldwide cleaning industry association and learn how a modest investment in cleaning can help facilities reap big savings. Did you know that ISSA has released an analysis of data which strongly supports the position that cleaning is economically efficient and, thus, a relatively modest investment in improved cleaning produces substantial returns. Clean floors speak volumes in any facility or business. Discover more about the Value of Clean in this new animated video infographic from ISSA. It’s a quick, effective way to show your staff and customers how a modest investment in cleaning can help facilities reap big savings. Floor polishes have changed significantly over the decades, and as they’ve changed, so too has the floor maintenance industry. Floor polishes have changed significantly over the decades, and as they’ve changed, so too has the floor maintenance industry. Natural waxes that played an integral part of the early floor maintenance polishes have gone by the wayside, and new polymer emulsion finishes have successfully taken their place. Although there are many different varieties of floor polishes today, the challenge of floor polishes is still the same; they must protect the flooring material while being easy to clean, possess an acceptable gloss appearance that is maintainable and provide a safe surface to walk on. That’s an awful lot to ask of a thin film of plastic. The term “wax” has been used for over a century in the floor maintenance industry, although it is now somewhat of a misnomer. Its roots come from the early days of floor maintenance with the use of natural waxes in early polishes. Many of the original waxes were made from the carnuba plant and mixed with a solvent to make a viscous paste wax. These paste waxes were applied using steel wool pads and maintained by buffing them with soft brushes in conjunction with a slow speed rotary floor machine. Later carnuba waxes were suspended in water-based emulsions to form liquid wax that could be easily applied with a mop instead of steel wool, and were unproblematic to buff with a brush or soft pad. When the first polymer emulsion floor seals and finishes entered the market, they set in motion changes that impacted floor maintenance then, and even more so today. The new floor polishes where more durable than waxes and the ease of application was simple enough that almost anyone could apply them without any trouble at all. The early polymer emulsions were generally no-buff systems that were applied and left to dry into a durable film. At this time there was very little maintenance, you either scrubbed and recoated or stripped and refinished. So the floors would start out looking very good and slowly (sometimes quickly depending on traffic) deteriorate to an unacceptable appearance. Cross link metal interlock floor finishes entered the market, which resulted in durable floors that would hold up much better than natural and early synthetic waxes. With them came spray buffing methodologies that incorporated synthetic pads used in conjunction with low speed floor machines. The finish was usually watered down 50/50 and applied to the floor using a spray bottle in a small area. The process filled in superficial scratches with floor finish and was buffed to a slightly higher gloss by smoothing the surface with the floor machine and pad. This was a method that was widely used and is still referenced in many specifications to this day. Unfortunately, spray buffing was a time-consuming and a very slow process. In order to speed up the process, high-speed and ultra high-speed buffing machines were invented and better results were achieved quicker. With the new machines came new variations of pads and floor finishes. The new floor finishes were incorporating pure acrylic, styrene acrylic and in some cases urethane polymers. Some of these floor finishes became too hard and difficult to maintain, that’s when thermoplastic polymers hit the market. These new floor finishes made a significant change in floor maintenance. Thermoplastic floor finishes had the ability to become malleable with heat and friction, but when they cooled down, they would transform to a durable film. Battery and propane buffing equipment was invented to maintain this new generation of floor finish and the “wet look” was easily achieved and maintained. Most of the history of floor finish has focused on the durability, ease of cleaning, appearance and safety of the film. Modern developments of floor finish include more durable polymers (semi-permanent and permanent systems), higher solids content, matte finishes and slip resistant formulations. One of the newest developments is the use of anti-microbial preservatives in floor finishes. This new technology allows for an EPA-registered broad spectrum biostatic preservative to be incorporated into floor finish. The new development results in a film that inhibits the growth of microorganisms that it comes in contact with. This is not to say that it kills organisms that it comes in contact with, rather it prevents micro-organisms from reproducing by destabilizing metabolically active cell membranes which result in subsequent growth inhibition and cell death. The impact that antimicrobial preservatives in floor finish may have is extremely important for floor maintenance programs in any environment. But it is even higher when you consider the additional protection that can be attained in the healthcare, education, day care, assisted living and any other environment where micro-organisms exist. This may very well be the single most important development for the future of floor maintenance in those environments. The evolution of floor finishes has truly been a phenomenon when you think about it. When the combination of wind, water and gravity can erode the Himalayas, what chance does a thin polymeric film have against the same elements? The ability to continually restore the “wet look” of that thin film over and over again is nothing short of amazing. And now that technology has given us the ability to build anti-microbial preservatives into floor finish that protect us against what we can’t see, I would say we are treading on ground that is very close to miraculous. Well, I guess it’s not just wax anymore. Stanley Quentin Hulin has been actively involved in the industry, providing services, management and sales/marketing expertise since 1975. Stan conducts training seminars and clinics, establishes educational programs and serves as a speaker at industry conventions and meetings. Who Invented the Vacuum Cleaner? There were many people who had a hand in “inventing” the vacuum cleaner. Every invention and patent has made minor improvements and has evolved into what we use today. Many people are under the assumption that H. Cecil Booth, a British engineer, was the first person to patent the vacuum cleaner in 1901. The first person to patent a version of the vacuum cleaner is Daniel Hess, from West Union, Iowa, in 1860. His patent was actually called a carpet sweeper and not a vacuum. This carpet sweeper had round brushes that spun around to pick up the dirt. His invention also had a detailed bellows system on top of the body to produce suction. The first hand-powered cleaner was called the “Whirlwind” used the vacuum design and was invented in Chicago, Illinois in 1865 by Ives W. McGaffey. This invention was also not motorized and used a hand crank to operate a fan to generate suction. This design was not very heavy, but was hard to operate due to the fact that you had to turn the crank while you were pushing it over the rug or floor. In 1869 he patents the “Whirlwind” and starts the American Carpet Cleaning Co.
Another person who has helped the evolution of the vacuum cleaner is H. Cecil Booth. He observed a device that used a blast of air to remove the dust from the chairs on the train. Wondering if he could replicate the opposite effect, he spent some time trying different things. He wrote “I tried the experiment of sucking with my mouth against the back of a plush seat in a restaurant.” He understood that he would have to come up with a way to filter the air and trap the dust. He patented his suction cleaner in 1901, but because it was so large it was carted around Britain by horses. This vacuum cleaner was made of an internal-combustion engine that used gas and did not include any brushes. His invention was well received by British Royalty and this opened up the door for other inventors to try and improve the vacuum cleaner. James Murray Spangler, an Ohio janitor, was allergic to dust and could not afford to leave his job. He decided to take matters into his own hands and tried to improve the way he swept the carpet. He used a soap box, an electric motor, a broom handle, and a pillow case as a rough design. He sold one of his devices to Susan Hoover, the wife of a leather goods manufacturer, and she was really impressed with the cleaner. William, her husband decided to invest in the manufacturing of these cleaners and bought the rights from James and made him a partner in Hoover’s Electric Suction Sweeper Company. The Hoover Company opened the door for other companies like Kirby, Oreck, and Dyson. The current day vacuum cleaner design is a basic one and how it works is straightforward.When you plug in the vacuum and turn it on, it turns on the motor that is attached to a fan. As the angled fan blades rotate, air is pushed forward in the direction of the exhaust port. The air particles are forced ahead and the pressure behind the fan drops, creating suction inside the vacuum cleaner. Friction carries the debris into the vacuum bag or canister trapping the dirt. Most vacuum cleaners that are made today have brushes to loosen up the debris and makes them more effective. Peter Scott, “Managing Door-to-Door Sales of Vacuum Cleaners in Interwar Britain.” Business History Review (Winter 2008). http://www.jstor.org/stable/36645109 (accessed February 2, 2011). Robert Kautzman, Patent for the Carpet sweeper. http://www.vachunter.com/galleries.htm (accessed February 4, 2011). Phillip M. Parker, Vacuum Cleaner: Webster’s Timeline History: 1849-2007 (New York: Icon Group, 2008), 5. Charles Panati, Extraordinary Origins of Everyday Things. (New York: Harper Collins Publishing, 1989) 138. Panati, Extraordinary Origins of Everyday Things, 140. HowStuffWorks, Inc. . Vacuum Cleaner diagram. They come in various sizes, shapes, textures and colors, so determining which floor pad departments should use is often dictated by performance. Facility managers have found that each has a long list of benefits, but according to distributors, the best bet for improved cleaning performance is the octagonal floor pad. Distributors aren’t alone regarding their positive opinions of these pads. Custodial mangers are experiencing performance benefits first-hand after testing the floor pad. In fact, many mangers are converting to the eight-sided options. Round floor pads are the most common option used in facilities. And many of the benefits that facility managers are familiar with when using the round options are also advantages to the octagon pads. Take for example the face contact, which is the amount of surface area of the pad that comes into contact with the flooring. According to Kowalski, the face contact on the octagonal pad is very similar to that of a circular pad when managers evaluate performance. The octagonal pads are also available in the industry standard color-coded options, making them an easy substitute. Also, just like their circular counterparts, octagonal pads can be used with various types of floor equipment. Custodial managers won’t need any special machines when incorporating the eight-sided pads into their floor care program. As far as mounting the pad and operating the equipment, there is no additional training necessary either. But, Kowalski does point to one concern customers may have using the octagonal pad for the first time. Although there are many similarities between these eight-sided pads and traditional circular options, there are also enough differences that might make the switch worthwhile. According to the product manufacturer, the octagonal pads are ideal for custodial managers looking for the highest shine, the quickest cleaning and stripping, and the highest performance. Distributors attribute this improved performance to the leading edge available on the octagonal pad, versus the passive round edge on the circular pad. Every time the pad rotates, the edge comes around, providing additional scraping action. According to Kowalski, the leading edge provides a scraping action, which leads to improved performance. The manufacturer touts that with the irregular surface on the octagonal pads, departments will see results more quickly and at a higher level. If that is the case, incorporating these pads could improve cleaning times, saving valuable labor dollars for departments. Although the pad manufacturer can’t quantify the claims, there are additional benefits custodial managers have found when using the octagonal floor pads. His clients also comment that the pads are less likely to throw slurry when stripping and scrubbing, and they will kick away sand and other debris, which reduces the risk of developing “thorns” on the bottom of the pad. These added perks are thought to be the result of the irregular edge and the voids between the high points in the octagonal pads. According to the manufacturer, when using this pad, custodians don’t put constant pressure on a round edge equally, meaning there is more pressure spread between the high points. This causes a “hit-miss” action, which is what might lead to these experiences from custodial workers. Distributors agree that the octagonal pad can be easily substituted for the circular options most facilities are currently using. For custodial managers looking for higher performance with less effort, these pads should not be overlooked. The proof will be evident in the results. No matter which shape floor pad departments use, it is essential to properly maintain them. If done correctly, the floor pads will perform better and last longer. To make this happen, managers are advised to train staff on the proper cleaning techniques and frequencies. Once a pad has been used, it contains soils and chemicals that can become harmful if not removed. Allowing these to dry on the pad can damage the fibers and negatively effect future cleaning performance. Instead, manufacturers recommend storing “soiled” pads in plastic until workers are able to clean them properly. Cleaning should occur after every use and can be easily completed using a hose with hot, clean water. Workers should be trained to remove as much of the soil and finish from the pad as possible before storing it away. There are some HTOs that are personal items that you definitely should not be responsible for. That’s why getting building occupants involved in office cleanliness is so important. This approach should be discussed with the customer and the offer made to provide information regarding the cost of lost days that result from poor occupant health practices that you have no control over. In addition to the direct costs of absenteeism, there are the hidden costs of “presenteeism.” Presenteeism is when employees come to work sick. They underperform and their lack of productivity costs the company money. In addition, they spread sickness to others. Jeff McGee, assistant director of building services at the University of Maryland, introduced the concept of “Everyone Cleans” along with the benefits of cleaning and sanitizing to faculty and staff. This program proves people respond positively to the facts and concerns for their health. Be prepared with newspaper articles, statistics on surface contamination, etc. Your supplier can be a good source of information. Besides engaging building occupants in office cleanliness, involve your janitors in reviewing general procedures and updating them to make them site specific. This engages employees while they are being trained and engaged employees are proven to be more productive. A performance log can serve as due diligence in the case of an outbreak of disease. If cleaning and sanitizing of HTOs is included in your workloading inspection program, that may serve as adequate due diligence. If not, a record or log of this may become important in the future. Tradition holds that a building service contractor’s signature is created by the appearance of the floors and the cleanliness and freshness of restrooms. With the new healthcare legislation, the spread of antibiotic resistant bacteria into the public sector and the risk of lawsuits, additional due diligence should be foremost in the mind of every owner and supervisor in our industry. The health of the occupants of your customer’s buildings rests in your hands. I can think of no better way to enhance a BSC’s image than to show concern for the customer’s building occupants supported by a professional program. Attended San Jacinto Junior College and University of Houston. I.C.E.-GB; LEED Accredited Professional. Served his country in the US Army, and was decorated for heroism in ground combat while serving in Vietnam. As an RM, earned numerous sales awards over 22 years. Created the Training Certification Program™, which enables customization of cleaning procedure manuals for end-users. Promoted to Divisional Sales Manager and directed five divisions. Mentored numerous industry sales professionals. 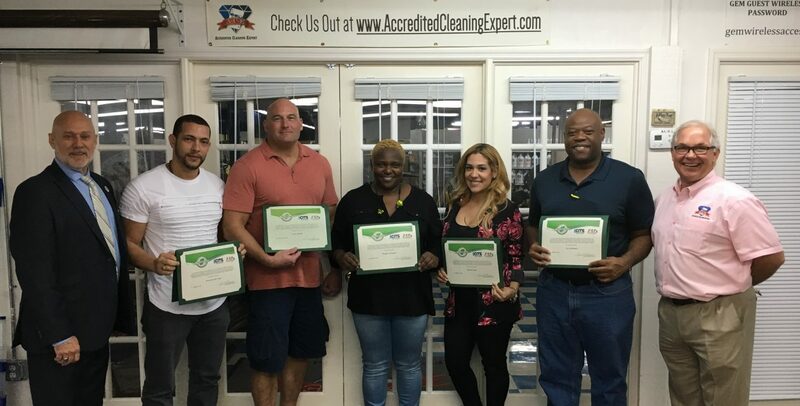 Created Spartan’s Certified Green Cleaning Specialist Program.